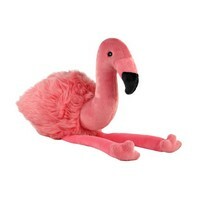 With her long neck and floppy legs the Fluff & Tuff Lola Flamingo is an ideal toy for dogs that like to shake and toss their toys. Your dog will have hours of fun. She's a show-stopper with her bright pink color and feathery, ultra-plush fabric. The Fluff & Tuff Lola Flamingo has double-stitched reinforced seams, sewn eyes, durable mesh inner lining for the under amour and a non-toxic fibre stuffing for your dog's enjoyment.